This domain is the central domain of AARP2. 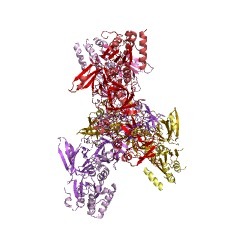 It is weakly similar to the GTP-binding domain of elongation factor TU (PUBMED:15112237). This domain is the central domain of AARP2 (asparagine and aspartate rich protein 2). It is weakly similar to the GTP-binding domain of elongation factor TU [(PUBMED:15112237)]. 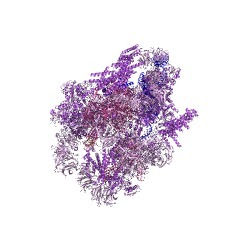 PfAARP2 is an antigen from Plasmodium falciparum of 150 kDa, which is encoded by a unique gene on chromosome 1 [(PUBMED:9247928)]. The central region of Pfaarp2 contains blocks of repetitions encoding asparagine and aspartate residues. There are 3353 AARP2CN domains in 3350 proteins in SMART's nrdb database. Taxonomic distribution of proteins containing AARP2CN domain. This tree includes only several representative species. The complete taxonomic breakdown of all proteins with AARP2CN domain is also avaliable. Click on the protein counts, or double click on taxonomic names to display all proteins containing AARP2CN domain in the selected taxonomic class. Binding / catalysis: GTP-binding ?